There are many reasons to travel to the west of Ireland: soaring cliffs, scenic road trips, salmon fishing — and spas? 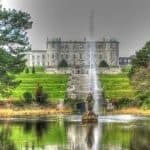 While the western counties of Ireland might have more of a reputation for famous golf courses and outdoor adventure activities than spas, there are five-star hotels here that offer a spa menu to rival any city center spa. 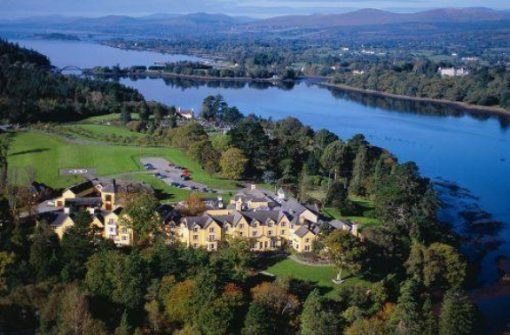 One of my favorite five-star getaways in all of Ireland is located in this part of the country, in County Kerry. 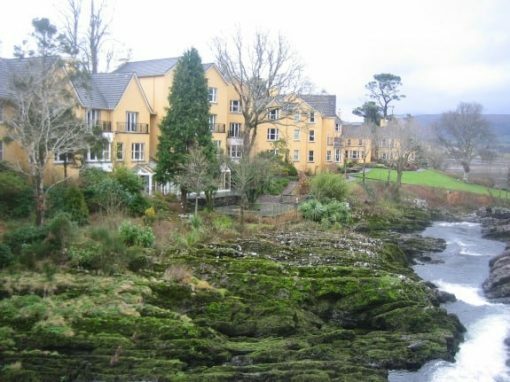 Sheen Falls Lodge is perched outside the village of Kenmare, in one of the most beautiful areas of County Kerry. Here, roaring fireplaces, an incredible restaurant, and a heated indoor pool will all force you to take things a little slower. Sheen Falls Lodge is much more than your regular five-star hotel. Like many attractions in Ireland, Sheen Falls Lodge has a long history. First built in the 1600s as the summer residence of the Marquis of Lansdowne, the lodge is now a Relais and Chateaux property with a library, extensive wine cellar, restaurant, and plenty of outdoor activities. The whole lodge flanks the River Sheen, and the sound of rushing water can be heard from many guest rooms. During warm weather there is an outdoor patio to enjoy this scenery, or grab a seat by one of the many wood-burning fireplaces to enjoy the views during winter. First and foremost, Sheen Falls has established its reputation for other parts of the hotel. There’s the wine cellar with over 10,000 bottles of wine, the largest public wine collection in the country. For wine enthusiasts, a tour of the cellar from the in-house sommelier is guaranteed to be a highlight. The grounds are home to many outdoor activities, from a game of tennis to salmon fishing to hitting the hiking trails. 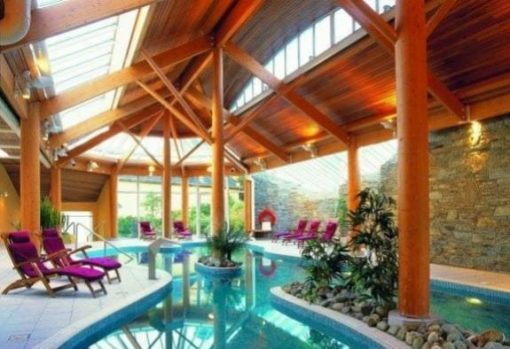 Yet despite all of these attractions, the spa at Sheen Falls is a destination in itself. Slip into a fluffy robe and cozy slippers in your room and head down to the Sheen Falls Health Club for a peek. The heated indoor pool is particularly striking for its curving shape, the incredible amount of natural light in the room, and the appealing stone walls. Whether you choose to swim or lounge in one of the chairs by the pool, this is a great place to relax. There’s also the bubbling hot tub when you’re craving a good soak. Beyond the basic facilities, Sheen Falls also offers a number of spa treatments and massages. Take a look at the spa menu before arrival to narrow down your options. 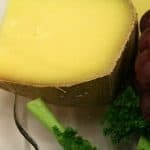 Some of the most popular treatments include the La Grande Classique Facial, an herbal body wrap, a paraffin pedicure, or one of the many massages. From the simple Indian Head Massage aimed at relieving stress to the full body Swedish massage, there are many ways to relax in the hands of an expert at Sheen Falls Lodge. During my visit to Sheen Falls Lodge, I had arranged for spa treatments in advance, as suggested. My soothing spa experience began with a facial, complete with aromatherapy based oils, masks, and creams all designed to cleanse the skin deeply and leave it feeling refreshed and nourished. This hour and 15 minute treatment achieves this and so much more. Not only did I leave this treatment with revitalized skin and that just-after-spa glow, but the atmosphere of the treatment left me feeling incredibly relaxed. While spas in the city can definitely have their place, there’s nothing quite like emerging from a relaxing spa treatment into a relaxing, country atmosphere. I went for a swim, wrapped up in my cozy robe, and relaxed in one of the lounge chairs by the pool. Outside night began to fall on the property. After a spa treatment, my senses were heightened and ready for a meal at the five-star, in-house restaurant at Sheen Falls, La Cascade. To keep all spas running smoothly, there are usually some ground rules. At the Sheen Falls Lodge spa, they are simple: treatments need to be cancelled 48 hours in advance to avoid a 75% charge. Guests who cancel on the same day as the appointment will be charged 100% of the treatment cost. Guests are advised to arrive at least 10 minutes prior to treatment time to relax and get set up. This will maximize your appointment time. Guests who arrive late will forfeit part of the time of their treatment. It is strongly advised for treatments to be booked in advance of your visit, but sometimes last minute bookings can be accommodated. 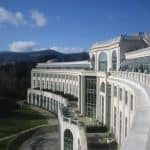 Spa prices: La Grande Classique Facial 85 euros, Detox Herbal Body Wrap 125 euros, Indian Head Massage 80 euros, full body Swedish massage 90 euros. Spa packages are often available; consult the packages page on the Sheen Falls Lodge website. Photo Credit: First 2 photos courtesy of Sheen Falls Lodge, final photo from the personal collection of Jessica Colley. 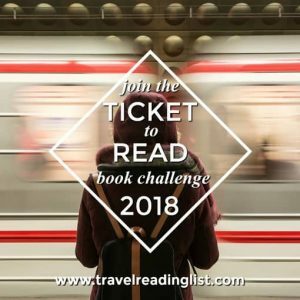 Disclosure Notice: The author was the guest of Sheen Falls Lodge for the purpose of a review; all opinions are strictly her own.